When I first considered running this test I figured it would be quite hard work and would take a few days to complete. Little did I know I would end up spending around a hundred man hours completing it. The test started as a reaction to a few articles comparing digital with film over the years, all of which were lacking in some way. Some overestimated the resolution that can be laid onto film by large format lenses, others missed out on critical techniques to make the sharpest pictures on one platform or another. In all though, there was definitely room to make a definitive review of high resolution imaging technologies. 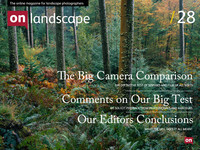 I was in a fortunate position to know the supplier of Phase One cameras in the North of the UK and to have a business partner who had a great deal of experience shooting digital and film cameras and hoped (naively perhaps) that including two ‘experts’ in the digital side of photograph would circumvent some of the criticism from that camp. We also spent some time making sure we had the best gear for the digital cameras, knowing that someone somewhere would say “Ah! You should really have been using a Alfalfa Alpagon on a steel reinforced concrete plinth!”; so we talked to Paula Pell-Johnson from Linhof Studio who loaned us the Alpa SWA with a Digaron 40mm lens which combined with the Phase One 645DF, Cambo Wide and Linhof Techno which we had access to already should be enough to cover a few different bases. We also talked on various forums about how best to get the sharpest pictures and finally calculated the depth of field based on the pixel size of the IQ180 (turned out to be 10cm either side of the target at the 7m distance for our studio test) to ensure we weren’t asking too much of our focussing abilities! It was also thought that a good test would be to include some DSLR’s and so we arranged for a colleague, John Robinson, to come with his Nikon D3X and combined with my Canon 5D2 and Dav Thomas’ Sony A900 and a couple of tilt shift lenses from “Lenses for Hire” we covered quite a range (not forgetting the legendary Mamiya 7 in the middle). The day of the test turned into an epic 8am to 5pm marathon with the majority of this taken up in the studio. Each camera was focus checked at least three of the five people present (All four of us, Chris Ireland, Tim Parkin, Dav Thomas, Joe Cornish and John Robinson) and the Alpa was checked by everybody (we all wanted to see how astonishing the Alpa fresnel and ground glass was!). Focussing wasn’t easy at times either. We were targeting the ‘resolution trumpet’ (we really need a better name for that) and we could only ever manage to see the low resolution version on all cameras apart from the 8x10 (which we hoped had a good ground glass registration - turned out it did). Even the live view on the Alpa was not the easiest thing to use because of the 1s refresh rate. We did spend some time taking multiple pictures with very small shifts of focus whilst checking the maximum resolution we could achieve afterward so became very confident that we were achieving the maximum we could get out of the cameras. The most difficult focussing was probably the Mamiya 7 though, trying to get critical focus using the Rangefinder wasn’t that easy. However, I did find a ‘cheat’ way of doing it which was using the video camera on 100% zoom and pointing it through the rangefinder window! I shouldn’t have worried in the end because the effective depth of field for the Mamiya was even more than the IQ180. Around 2pm, after 6 hours of studio shooting, we decamped to the Yorkshire Moors for the ‘landscape’ test. Joe found an excellent spot that he has used a few times in the past and we spent another two and a half hours getting very cold whilst setting up multiple cameras. The IQ180 on the Phase 645DF was as easy to use as the Sony A900 and Mamiya 7, taking very little time to set up beyond working out the best focussing point for hyperfocal operation. Setting up the 4x5 wasn’t too much of a hassle either, only taking about ten minutes to get set up. The 8x10 was a different matter and even using two of us, it still took a good 15-20 minutes to get set up, stable and focussed (we were using two tripods on the 8x10 - pretty essential for sharp shooting as the camera flex is enough to degrade the image). The windy conditions had us thinking that the 8x10 would probably do worse than the 4x5 in these conditions but the combination of Joe and my skinny frames blocking the wind the results proved better than expected (although one of the Velvia frames was slightly fuzzy). Well, I’ve refrained from commenting on the results until everybody else has chipped in so as not to influence people but here goes. What do I think? Well, I have to say I was incredibly impressed that the 8x10 could manage to nearly double the linear resolution of the 4x5. Most sources will tell you that you sacrifice a lot of detail using 8x10 but we definitely proved that if you can avoid stopping down too much then you can get astonishing resolution out of 8x10 photographs. However, at larger taking apertures this can be a different story, more on that later. Let’s start with the results that started the exercise in the first place, the IQ180 vs 8x10. Well the results put that to bed and pretty authoritatively at that. The studio test shows that the difference in the capabilities of the two systems is enormous. The IQ180 files are 7,660x10,328 pixels whereas the resolving power of the 8x10 system can generate pixel sharp images at 22,400 x 28,000 pixels, nearly three times the linear resolving power and nine times the ‘megabyteage’ at an astonishing (and computer defying) 630 megapixels. Our 4000dpi scans of the 8x10 transparencies generated a 7.6Gb 16bit file, finally pushing me to upgrade my 8 core Mac Pro to 16Gb of RAM and a 64Gb SSD raid 0 scratch drive - and it was still painfully slow. This isn’t quite the end of the story though, as seen in Hans Strand’s comments where he says he is getting better results from his medium format back than he was getting from 5x4 and 8x10. Digging a little deeper, Hans was using much larger apertures that used in the tests so I did a few calculations. The following table might look really confusing at first but bear with me. What I've done is to provide, for each platform, a list of aperture's used in the test where each row shows an equivalent aperture for each platform. i.e. the first row in each table is the aperture that gives the same depth of field for that platform. What follows this is the theoretical maximum enlargement based on diffraction (based on the table here) - however I've modified these to limit the maximum enlargement based on a couple of different factors. The first limitation is the maximum enlargement of a 35mm digital ~20Mp camera which is 12" x 18" (at 300dpi). The next limitation is placed on the Phase IQ180 system because it has a maximum enlargement of 26" x 32" (based on 300dpi). The next limitation the maximum resolution for lenses for the Mamiya 7 which is about 100 line pairs per mm. The final limitation is the resolution of LF lenses which is about 70 line pairs per mm. Each of these tables now shows the largest enlargement in mm for each platform and each f-stop for equivalent depth of fields. Fortunately you can ignore all of that maths and skip your way down to the very last table which shows the ratio of the different platforms to each other at equivalent focal lengths. The last section shows the aperture for each platform and the ratio difference in achievable resolution. As you can see, when we are working at the operating apertures we used in the Studio test, the 8x10 is capable of over 200% of the resolution of the IQ180; However, as the need for depth of field increases this advantage starts to disappear. By the time you are using an aperture equivalent to f/5.6 on 35mm cameras, the advantage of the 8x10 over the IQ180 has dropped to 50% and if you should need to stop down to the equivalent of f/11 then the advantage of 8x10 has disappeared. The advantage for 4x5 is is minimal - the theoretical advantage is 10% for smaller apertures but this disappears by the time you get to around f/8 equivalent and for apertures smaller than f/8, the IQ180 has a distinct advantage over 4x5. (don't forget that these are 'equivalent' apertures based on 35mm - the actual aperture is shown in the table above - pick a row from each table to see the equivalents, e.g. the first row in each table is the equivalent in terms of depth of field). Now this matches up with our studio and field work quite well. The distinct advantage to 10x8 is rapidly degraded by the time you get to the field work where it has maybe 50% advantage in resolution. The same is true of the 5x4 shots where at the taking apertures of f/22⅔ showed a similar resolution to the IQ180. Just as an aside, the Mamiya 7 did very well in the resolution tests and yet the files looked a lot worse than the absolute resolution would indicate. This is due to the grain of the film starting to obscure tonality and fine detailed textures. Low contrast elements got lost within the grain in most cases. The Mamiya 7 ended up resolving considerably more than the DSLRs but looking only slightly better than them. At first it looks like the DSLR's are quite a bit sharper but once you look closer you see that the details are quite mushy. this is something that has been observed in the IQ180/film results also and is symptom of the way digital and film resolve fine detail. With digital, the finer and finer detail in an image are quite contrasty all the way to the resolution of the sensor and then, at that point, there is no more detail. The camera detail hits a resolution brick wall beyond which it cannot go because of the size of the pixel. Film, on the other hand, renders detail quite differently. Finer and finer detail loses more and more contrast so that at the point where digital hits a brick wall, film has lower contrast so the digital looks sharper. However, the film keeps on going finer and finer until either the grain overwhelms it or the scanner runs out of resolution. What this can mean is that digital can look sharper "at a certain critical resolution". This resolution is dependent on the format but having printed out lots of tests, seems to be at the point of a 300dpi print at native resolution. Once you enlarge beyond this, film carries on looking good but digital starts to look 'plasticky'. Having said that, this critical resolution for the IQ180 is 26" x 32" print - quite good enough for nearly all purposes. In our final print comparison, once you enlarge beyond this to 40" x 50" for example, the 4x5 and definitely the 10x8 start to look better than the IQ180. One of the inevitable side effects of the digital cameras used is that caused by the Bayer Array. The bayer array means that not every pixel counts for full colour information. In fact, for red and blue, only one in four pixel counts. These effects are not generally seen but as you approach the resolution limit of these cameras, strange things start to happen. The obvious effect is that occasionally colour will appear where there was none in the original picture, or colour will disappear where there was some. For instance, if you look at the close up detail of the nikon lens, the white numbering on the aperture rings have begin to be coloured on the IQ180 files. Also, some of the red berries in the water in one of the transparency tests have almost completely lost there colour. Less obvious is why we appear to have some sort of grid pattern on the resolution chart for the IQ180 and why this grid pattern is overlaid with blue and red colouring (image shown below). There are a few things going on here - firstly we have the fact that once the resolution of the lines gets higher than the resolution of the sensor, we get lots of aliasing happening. This means that the raw conversion algorithms can't work out what is a line and what is a dot. Why should they be working these things out in the first place? Well the aim of raw conversion is to take the data given and to create something that looks as sharp as possible. In order to do this, the algorithm takes the individual pixel data from each of the colour channels and tries to work out whether there are any contiguous lines or shapes. If there are, then the system can sample the brightness of each of the green, red and blue pixels along this line to work out what colour it should be (adding in the missing data for places where there are no red or blue pixels). When there is no obvious lines, the system hunts around trying to find anything that looks like one and in this case, mistakenly thinks that we have some vertical and horizontal lines and also mistakenly works out the colour as either red or blue depending on exactly which pixels happen to sit over these lines. The means that instead of a blurred effect, we get a mosaic like grid effect; and instead of a lower contrast grey colour we get a textured, coloured effect. As well as on the nikon 50mm lens, the effect is also very clear on the Nikon logo on the larger lens. 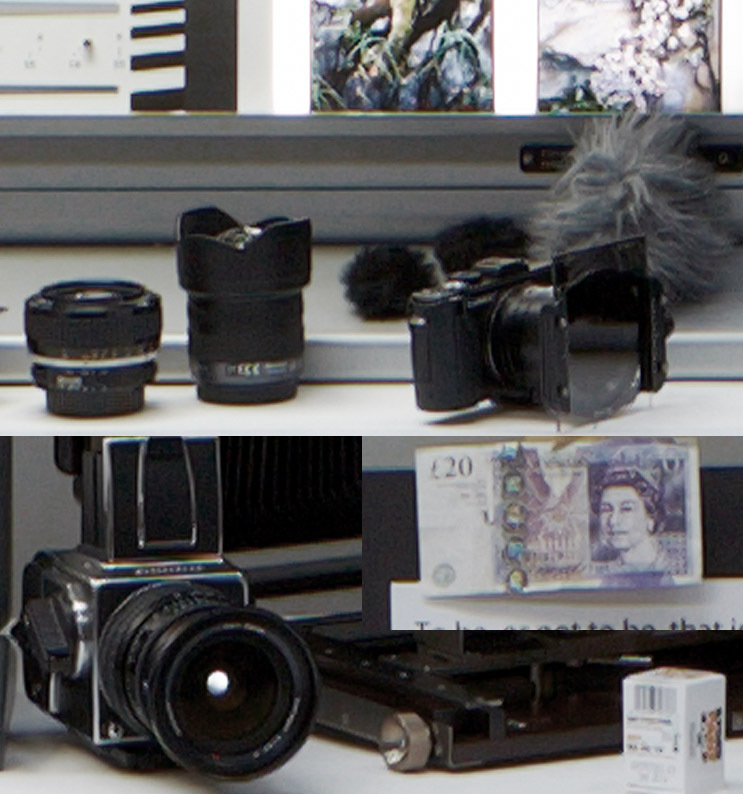 Here is an image showing the individual pixels that represent the Nikon text. As the small lines of white text pass over the different coloured bayer filters, the colouring tends to either blue or red. You may wonder why you never see a green effect? Well this is because each row of pixels always contains green, in fact every other pixel. However, each row also contains either red or blue pixels. So one row will be green red green red and another will be green blue green blue. So depending on which row or column the white text hits will result in a different coloured tint. If the white line of the text spans two rows, then the blue and red cancel each other out and we get back to white again. 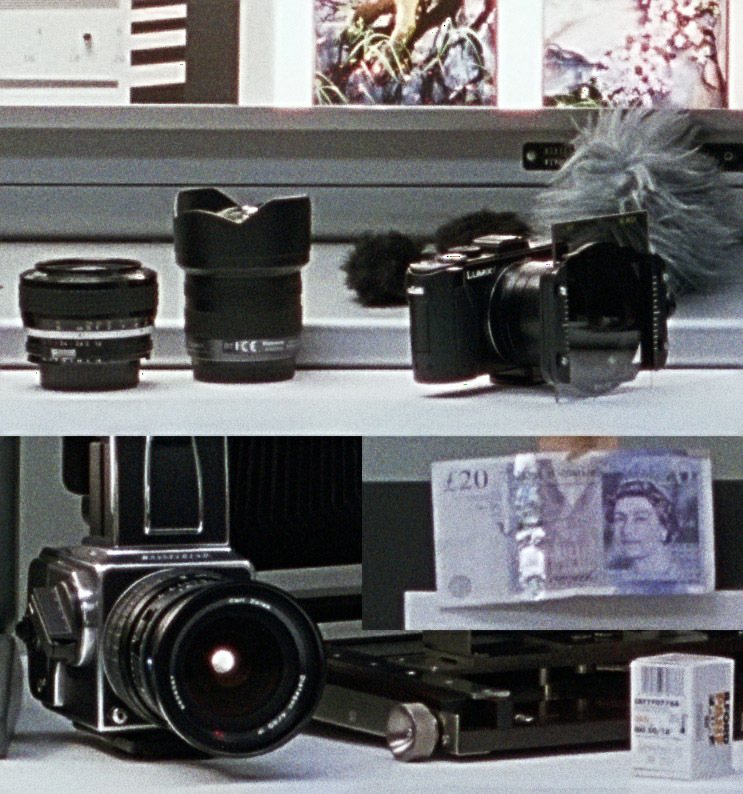 All of the film was scanned on a 4000dpi Howtek 4500 drum scanner that can be purchased from between £800 and £1,200. These scans have picked up all of the detail of the 8x10 film but for the f/11⅔ 4x5 file, the microscope results tell us that there is more detail to be scanned. This does suggest that it may be possible to get more detail out but we would have to have access to a 12,000 dpi scanner to do so (the 8,000 dpi scanner we tried did not give a significantly greater amount of data). The Mamiya 7 results were very surprising though. The scans provided a great deal of detail but when we examined the results through our microscope we were amazed to see a significant amount of extra detail still left. For the Mamiya 7 T-Max image, the resolution detail matched the 4x5 4000dpi scan! This does suggest that it may be possible to get a result from the Mamiya that would compete with the IQ180 in a very, very good darkroom. Achieving this in practise is unlikely though, but that won't stop me trying. We also had a look at how much detail we could get out of the film if we only had access to an Epson flat bed scanner (V750). It was no great surprise to see that the Mamiya 7 results were degraded to a point where they were only really a match for the Canon 5Dmk2, not quite matching the Nikon D3X. The quality of the 4x5 files was degraded to a point where the detail resolution was a little worse than the IQ180 but the overall result was aesthetically a lot worse for the transparency (you can see this comparison on the Nikon Lens test in the smaller sample of side by side comparisons). However, scanning the Portra 400 on the Epson resulted in a file that was not a huge amount worse than the drum scan in terms of resolution and colour fringing. This would suggest that if you don't have access to a drum scanner, you may be better off shooting negative film? The 8x10 Portra 400 scan was hardly degraded at all however; the results showed a similar level of sharpness of that of the drum scan with very little evidence of the colour fringing and halation that flatbed scanners are renowned for (all Epson V750 scans were made at 4800dpi and down sampled to reduce noise). The very last task that I undertook was to make prints of all of these images at various sizes from 20"x24" to 64"x80". Obviously I didn't print them at full size but I did make 12"x17" crops. The results of these were quite enlightening. At 64"x80", the 8x10 print was considerably better, it held more detail and the tonality was smooth even though it was slightly grainy. The IQ180 image had that 'plastic wrap' look to it that wasn't particularly pleasing. I did wonder whether adding noise to the IQ180 file would improve that and to a certain extent it did. Although the IQ180 still looked soft in comparison with the 8x10, once noise was added (using Alien Skin's 'Exposure' plugin) the 4x5 and IQ180 prints looked on a par with one another. When you come down to 20x24 prints, the difference between the difference cameras is very difficult to discern a difference between the 4x5, IQ180 and 10x8 images beyond a difference in tonality. The Portra 400 and IQ180 produced very similar images but the Velvia 50 had a definite ability to separate tones, especially in foliage, that both the IQ180 and Portra 400 couldn't manage. This wasn't possibly replicated in Photoshop either. Whether you like that difference or not is a subjective decision - personally I like it in some images and not in others. It's also as impossible to emulate as it is to remove so if you get your Velvia image, you won't be able to wind it back out again - it isn't just saturation by a long shot. Back to the Sony A900 for a moment. I was incredibly impressed with the output of this camera on the landscape test - the colour rendering was very natural and looked very similar to the IQ180. During this test the results from both this camera and the Nikon D3X have been very impressive and although I'm a bit tested out, I would love to do a comparison of DSLR colour at some point in the future. OK - what do I think of all this after spending so long on it. Well, first things first; The IQ180 is the first digital camera that really competes with the best that film can manage. It has the resolution to compete with 4x5 and 8x10 for prints up to 30"x40" and, more importantly for me, it has the colour rendering to compete with negative film. In all respects it is a very highly desirable item. So I would say that if you have the money, either through the volume of work you do or personal reserves, then think about buying one of these. They will produce results that will cope with almost all jobs. I say almost all jobs because there are still three areas where film excels. The IQ180 has one of the highest dynamic ranges of any production digital camera and yet it is still a long way from matching the dynamic range offered by colour negative film, especially the film that has just been released by Kodak, Portra 400 and Portra 160. The truth is that in many situations, especially if you are working at sunrise and sunset, you will still occasionally have to use graduated filters or blend multiple exposures together. It is estimated that the IQ180 has about a theoretical 13.5 stops of dynamic range but in fact has about 10 stops of usable range. Portra 400 has a theoretical 19 stops of dynamic range and a usable 15 stops (see here) and although could arguably benefit from a graduated filter occasionally, most people don't use them and don't need to. I have accidentally left a lens aperture open on a Fuji 6x17 after using the ground glass to focus and only noticed after a minute. That was 10 stops of overexposure on the film that I had just loaded into the camera. I was stunned when there was still an image scannable on the developed film (albeit a little grainy). The IQ180 has stunning colour and I would say that this is a more important reason to buy this camera than it's resolution. However, the different colour film stocks available - especially Velvia 50 - give a range of palettes that just are not achievable even through photoshop work. Some artists, such as David Ward, using the idiosyncrasies of these palettes to their advantage in their creative colour work. Until film disappears, this gives a unique rendering of the world. Until the IQ180 has a bluetooth tether to an iPad and at least a 15 frames per second live view, a ground glass screen is still one of the most accurate ways of composing images. There is no replacement for working with a reasonably large image in an environment abstracted from the real world. Even the upside down nature of the ground glass is argued by some as an advantage. Obviously many artists can work without this but on the other hand, many artists (just like many art directors in studios) find working on a large scale representation of the image a critical part of their compositional workflow. Well - I had to say this one didn't I? Myself and Dav Thomas hold large format workshops and we have some recommended kit for clients that would allow them to build a two lens large format system for under £1000. Quite recently I bought an 8x10 camera with reducing back and dark slides for £1000 also. I develop my own film so each frame of 5x4 only costs me about £4 a sheet (or £2.50 if I shop around for short dated stock). I shoot about 300 sheets a year which ends up costing about £1000-1500. In other words the outright purchase of a 5x4 system and two years shooting could cost less than a two lens DSLR system. My 10x8 shooting is a bit more expensive at about £8 a sheet (which would be £15 a sheet if I bought new film and sent it off for developing). I operate an Epson V750 scanner and a drum scanner (got to get a plug in! http://cheapdrumscanning.com/) and hence my scanning outlay was an initial £1200 on top of which consumables cost about £50 per scan. Do I need to go into these? Loading dark slides, carrying the equipment (although a minimal 4x5 kit can weight less than an IQ180 set up), developing, scanning, spotting film, inverting negatives, missing transitory light, processing huge files, etc, etc. All of these are true. My conclusion? Well, If the IQ180 were £10k and lenses for it were about £1k each then I'd be saving up. Would I get rid of my film equipment as well? No.. The process of shooting large format and some of films unique characteristics (i.e. Velvia colour, Portra 160/400 dynamic range) still give me something I want.